Henry has been accused of landing a sucker punch. 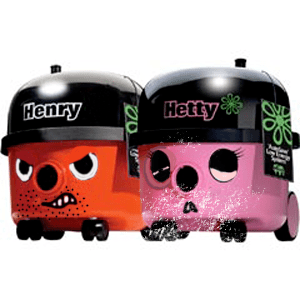 Well-known cleaning couple, Henry and Hetty Numatic, have filed for divorce amid shocking new revelations about their private lives. The new revelations follow the publication last week of an image showing Henry on the half-landing of their big house on the Dunstable Road with his electric cable wrapped round Hetty’s face. Fortunately the damage was only cosmetic. “It’s nothing a bit of plastic surgery can’t fix,” said Henry, dismissing the strangling allegation as nothing more than ‘a cable entanglement incident’.